I’ve been asked on several occasions to teach others the techniques that have helped me become a seasoned poker player over the years. Wanting to provide some solid tips, and better my own play for future games of Texas Hold’em, I thought it would be a good idea to review some strategies I used while learning the game. For those that are just starting out, it’s important to learn the rules and lingo of Texas Hold’em. Betfair has a great breakdown of the game basics with easy to understand descriptions of blinds, and the three different types of limit variants. Once you to understand the rules, it’s easier to remember the different plays you’re able to make throughout the game. If you’re only focusing on making pairs, three of kind, and four of a kind, you’re going to be wiped out in just a few rounds. I’ve seen too many beginners throw away a good hand because they forgot what cards make up a flush. After you’ve mastered the vocabulary and understand different possible hands, you can move forward to strategizing your plays based on statistics. No, you won’t be counting cards, but knowing the odds plays a key role in how you should bet. Pokerology has detailed descriptions of statistics and common mathematical equations you can use to give you a leg up on your competitors. Even if you’re not a math wiz, you can still do some basic mathematical reasoning with the information you’re presented with on the table. Considering how many players are at the table, and how many cards have been distributed, what’s the likelihood that your card is still going to be played? On the other hand, keep in mind if you never take the risk, you’re never going to get ahead (It’s called gambling for a reason!). But if you’re strategy is to keep betting and always hoping the fifth street will complete a play for you, you’re going to be out pretty quick. When you’re ready to take your game to the next level, you can start to strategize beyond your own cards. 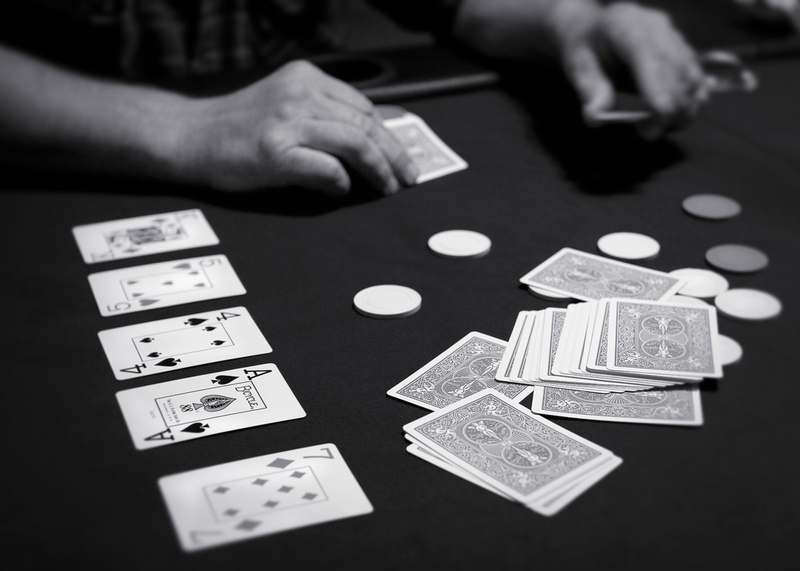 Professional poker players are constantly thinking about what hands are possible for their fellow players to make after the flop, (as well as after the turn, and the river). Pay attention to when your competition checks, folds, and raises. This will help you better assess any routine patterns or habits. And if you’re really feeling witty, you can try to pick up on any tells, ticks, or physical characteristics your fellow players may show when they have certain hands, to give you an idea of how to better place your bet. Remember your fellow players are being just as analytical of your actions as well, so keep your own tells or betting routines in check!